For general guidelines on practices in countries around the world as provided by our Cooperating Association partners, please select a country below. Are there restrictions on property or land ownership for citizens of your country? Are there restrictions on property ownership for foreigners? What is the home ownership rate? There is no official data at this time, however it will be provided soon. Is there exclusive representation in your country? Who is the party represented (buyer, seller, both)? No there is not. Agents can represent both. Who pays the commission fees? Are there licensing laws/government regulation of the real estate industry? If so, what are the renewal/ continuing education requirements? Yes. The license is provided by the government. You must pass an exam. And we do have a law that all agents must follow. Is there an MLS or other shared listings site in your country? What is the main property portal for consumer property searches? Do agents pay referral fees? If so what is the commission percentage? The commission is 5%. And we do split 50% when there are two agents involved in the business. Describe the real estate transaction process in your country. For example, do you have closings or is the property turned over upon contract signing? Do you have title insurance? Are commissions paid to buyer’s and seller’s agents, only one side, or neither? In Andorra, once both parts are in agreement, we do sign a contract before going to the Notary to pass the title of the property. In Andorra you can be agent for both parts. In that case you do not split. If there are two agents involved, we do split the 5% at 50% for each agent. No, we don´t have any restrictions on property or land ownership. However, we have special taxes for people who have more than one property. Yes, we have one specific restriction (national law no° 26.737) related to rural big areas. The law restricts the ownership for foreigners to a maximum of 15% of the Argentinian territory. The same limitation applies for any city, province or town (15% of total the land). It also determines the importance of lands with large amounts of water, prohibiting foreign property on such land. According to the last national census (2001-2010), the home ownership rate has decreased from 71% to 69%. There’s no further data because our next census will be on 2020 (2011-2020 data). No, there is no exclusive representation. In our country we can either represent the buyer or/and the seller. The law allows any party to pay the commission fees. There are restrictions on commission fees regarding percentage amount. All provinces may set their own law establishing the commissions percentage limits. Are there licensing laws/government regulation of the real estate industry? If so, what are the renewal/continuing education requirements? Yes, there are some licensing laws regulation. The National Civil and Commercial Code regulates the activity (arts. 1345 to 1355). Besides, National Law No. 20.266 regulates the industry. Finally, each province has its own specific regulation. There are no renewal/continuing education requirements. We have three main portals: www.mercadolibre.com.ar, www.zonaprop.com and www.argenprop.com. Do you pay referral fees? If so what percentage of your commission do you pay? There is no regulation on referral fees. Parties can pay a referral fee if it has been previously agreed. The buying process begins with the payment of a small amount of money that corresponds to the offer of one property. The seller can either accept or decline the offer. Once the offer is accepted, there are two options. The first option is to make a bill of sale that will generally consist on the payment of a 30-40% of the total amount of the property. In this case, the property is not turned over. The property will be finally turned over when the 100% of the price is paid and the public deed of sale is signed. The second option is to make directly the public deed (no bill of sale). In this case, the next step from the offer will be directly the payment of the total price. With this payment, the public deed is made and the ownership is transferred, simultaneously. There’s no title insurance in Argentina. Commissions are paid to both sides. The regulation allows one agent to represent buyer and the seller at the same time. From Census data: approximately one-third rent; one- third own their home outright; one-third are buying (i.e., have a mortgage). In recent years there has been a slight increase in the proportion renting as affordability declines. This is expected to continue particularly for ages 35 and under. Yes. Each of the 8 states and territories has differing requirements. Some have CPD others don’t. On occasions. No fixed level. Describe the real estate transaction process in your country. For example, are there property closings or is the property turned over upon contract signing? Do you have title insurance? Are commissions paid to buyer’s and seller’s agents, only one side, or neither? Contracts are normally formally exchanged between the potential buyer and the seller at the time the deposit is paid. In most cases, the solicitor or conveyancer representing each side does the exchanging. Once this has occurred, borrowers are legally bound to proceed with the purchase of the property, unless a special condition is breached that is listed in the terms and conditions of the contract. While private treaty sales allow a cooling-off period in which buyers can conduct inspections, auctions don't usually allow for a cooling off period. You also need to arrange conveyancing, for the transfer of property title from one person to another. For the next six weeks, sometimes less and sometimes more, your conveyancer or lawyer will make enquiries about the property. Survey and drainage diagrams will be examined, government departments will be written to, heritage orders will be inspected and council checks will be performed. At settlement your representative meets with the vendor to swap your cheque with their title of ownership – more and more in Australia at least part of this process is done electronically. Government departments need to be notified of the change in ownership, and this is typically taken care of by your solicitor or conveyancer. Title is generally freehold with the two territories – Australian Capital Territory and Northern Territory having leasehold but in practice the same. During 2017 and 2018, the recovery of the global economy continued, albeit at a below trend slower-than-expected rate with growth in the economies of Australia’s major trading partners being below their historical average. The rate of quarterly growth in Australian gross domestic product has begun to taper off. Falling home construction is a contributor to the outcome. Whilst the economic circumstances are showing signs of improvement and unemployment has showing modest improvement, wages growth is low and business and consumer confidence are still low despite four years of record low interest rates. Dwelling investment supported by historically low interest rates has been a significant contributor to growth in the Australian economy since 2013/14. Australia’s property industry has been a main driver of economic growth and increased employment in the transition away from a decade-long reliance on mining. Providing a stimulus to economic activity outside the mining sector, including the housing and building sectors, was amongst the main reasons for the RBA to keep the official cash rate at record low levels since August 2013. New home building has been a crucial support to economic growth over the past three years. The challenge during 2018/19 will be to manage the transition to lower volumes of new home building. Our central bank, the Reserve Bank of Australia has noted that “conditions in the global economy had improved and that the outlook had also been upgraded.” This improvement had been supported by expansionary financial conditions, notwithstanding some withdrawal of monetary stimulus in a number of economies. In the major advanced economies, labour market conditions had continued to tighten, but wage growth and core inflation had remained low. A surprise fall in business investment over the June quarter will most likely impact economic growth. Total spending on buildings and machinery unexpectedly dropped 2.5 per cent in the three months through June, after increasing 1.2 per cent in the March quarter. The drought Australia is experiencing will also impact on GDP growth with lower export earnings ironically when the $A is falling which would have provided greater earnings. In recent weeks, perhaps in part contributed to leadership battles within our Government, there are signs that spending growth may be faltering. Retail spending growth stalled in July, an unexpectedly weak outcome that suggests consumers may have become less willing to open their wallets amid falling house prices and weak wages growth. In terms of the real estate market, the heat has definitely come out of it in the last 12 months. Recent data shows that dwelling values across the eight capital cities fell for the 11th consecutive month. The price movements are not unexpectedly not uniform. There are geographical differences as well as differences between units and houses. The weighted average capital city median house price decreased to $765,098, a decrease of 0.8% over the June quarter and a decrease of 0.4% over the past twelve months. Over the June quarter, median house prices decreased in Sydney, Melbourne, Perth, Canberra and Darwin but increased in Brisbane, Adelaide and Hobart. Apartment prices could fall harder than house values this year, dropping by a further 8 per cent in Melbourne, and 4 per cent in Sydney, according to some forecasts. Units look much more vulnerable than single dwellings, with Melbourne appearing to be the most exposed of the eight capital cities. Using sales-to-new-listings ratio as a broad gauge of the balance between demand and supply, with more homes currently being listed each month than being sold, this ratio is consistent with house price inflation falling below zero in the next six months. Using this predictor confirms that the high number of units being listed for sale relative to the number being sold each month points to apartment prices falling more than for single dwellings. Whilst some continuing decline in house prices can be expected there is not a risk of “the balloon popping” as some have speculated. As mentioned earlier home buyers will pull back on other spending. Which is a risk to the Australian economy. Are there restrictions on property or land ownership for citizens? Yes, in most of our provinces there are regional restrictions regarding the transfer of agricultural land and forests as well as the acquisition of secondary (holiday) residences. Acquisitions by “foreign nationals”, i.e. nationals of non-EU and non-EEA states are contingent upon approval by the Land Transfer Authority. The home ownership rate in Vienna is only about 20%; in rural districts of some provinces it rises to more than 80%. Is there exclusive representation in Austria? Who is the party represented (buyer, seller, both)? Usually there is no single agency in Austria. The real estate agents represent both the seller and buyer. Each of the parties - the seller and the buyer - pays up to 3 percent of the sales price. The legal framework for acting as real estate agent is the so-called “Gewerbeordnung”. Continuing education is not yet required by law, but all members of our Association OVI have to show 8 hours of continuing education per year and employee. Is there an MLS or other shared listings site? MLS systems are actually being developed. Referrals are paid up to 10% of the commission of one party. A purchase agreement is concluded by acceptance of a proposal (offer). This means that a prospective buyer who has submitted a signed purchase proposal may be sued by the seller (once the seller has accepted it), if he/she consequently fails to fulfill it. Thus, a signed proposal has a binding effect on the signatories, and withdrawal is normally not possible. There are generally no particular formal requirements, i.e. a purchase contract may be concluded in writing, orally, or in some instances even by non-verbal conduct ('implied in fact'). This principle also applies to purchase agreements in relation to property. ; However, inscription in the land register requires a written purchase agreement. Thus, also an oral purchase agreement requires an ex-post deed, set up by a lawyer or notary. This deed must be notarized in order to be recorded in the land register. A notary’s deed is also required for purchase agreements between spouses, regardless of whether they are for an entire property, or only for parts thereof. After agreement on the object and the price under the law of obligations has been reached between the seller and the buyer (i.e., the purchase agreement), the legal hand-over is required. This is effected by inscription in the (electronic) land register, which is maintained by the district courts and where all rights in rem concerning the property are recorded. The land register is a public register to which brokers, lawyers and notaries generally have full on-line access, and from which they can retrieve all relevant data for their clients. The lawyer who drew up the agreement acts as a trustee for the contractual document (as qualification for inscription) and the purchase price. Further documents, deeds or permits may be required in addition. In the event that the property is released from encumbrances (mortgage), the trustee has to transfer the respective amount to the bank. The (remaining) purchase price is paid to the seller once the inscription of ownership is secured in the land register. Prior to concluding an agency agreement with the client (in the case of a “Consumer”), the agent has to hand over to the client – with the diligence of a proper real estate professional – a written statement indicating that it will act as an agent, and a list of all expected costs arising from the conclusion of the requested business transaction, including the agent’s commission. The amount of the commission must be stated separately; the agent must also inform that client of any economic or private relationship for the purpose of Sec. 6(4) third sentence of MaklerG (Real Estate Agency Act). When the agent – according to common business practice – can act as dual agent, the statement must bear explicit reference to this fact. In the event of any substantial change in circumstances, the agent must rectify the above documents accordingly. If the agent fails to fulfill this obligation before the client agrees to the brokered transaction, Sec. 3(4) MaklerG shall apply. The real estate agent has to provide the client with the required information (pursuant to Sec. 3 MaklerG) in writing. The information must in any case include all circumstances which are essential to assess the business transaction to be brokered. NOTE: Based on current business practice, real estate agents may also act as dual agents without the client’s explicit approval. In the event that the agent is instructed to act solely for one party in the transaction, the other party shall be informed by the agent. Provided by Chairman of the Membership Committee, Ethics and International Cooperation Belarusian Association "Real Estate"
You must be a citizen of the Republic of Belarus to have ownership of land. At the same time, it is not required to reside permanently in Belarus; just having citizenship is sufficient. Foreign citizens may own land in Belarus only through inheritance from a relative, who held an ownership of the land. Individuals can obtain ownership of land only for certain purposes; for example, for the purpose of construction of a new dwelling or maintenance of an existing one. The size of the land plot for construction and/or maintenance of a dwelling that an individual can purchase is established and enforced as follows: in metropolitan areas up to 0.37 AC, in rural areas – up to 0.62 AC. For private use as a farmland in a rural area, one can purchase a land lot up to 2.5 AC. There are no restrictions on the ownership of structures by foreign nationals in Belarus, only the land itself as described above. Foreign nationals can acquire ownership of structures without any restrictions but they can only lease the land that it sits upon. Such transactions can include construction of a new dwelling, purchase or sale of an existing structure or a part of the structure or the exchange of structures. 94.15% of residential real estate is privately owned, from which 88.69% is owned by individuals (According to the National Statistical Committee of the Republic of Belarus, December 2017). There is exclusive representation in real estate transactions in Belarus. In most cases, an exclusive contract is signed with the seller. The commission is paid by the party that receives the services from the real estate agent/company. Usually, both the buyer and the seller pay for the services to their respective agents/companies. have a minimum a four-year Bachelor degree with concentration in Law, Economics or Architecture and Construction. pass the certification exam offered by the Ministry of Justice of the Republic of Belarus. Once every two years every real estate agent needs to undergo continuing education under the program provided by the Ministry of Justice. Currently there is no standardized MLS in Belarus. There are several smaller databases that exist. The Union of Realtor Reengineering is currently working on developing the MLS system that would mirror the systems currently used in the US. The referral system between agents is not really popular in Belarus among real estate agents. On the rare occasion when there is a referral, the referring agent would receive a flat fee of $500 from the receiving agent. At the closing of a transaction and after the signing of the proper property transfer paperwork from the seller to the buyer, the transaction is registered at the National Property Appraiser Agency.Title insurance is not mandatory, but can be obtained at the buyer's expense if the buyer wishes to do so. This concept is not yet fully developed in Belarus. Real estate companies do have errors and omissions insurance. In case of problems with the property, which might arise due to an oversight or mistake by a real estate organization, the insurance company pays the damages to the injured party. The commission is paid by the buyer and/or the seller of the property to the real estate agency that handled the sale of the property. In some cases the buyer would pay a part of the commission to his/her agent for providing the service of finding the right property and handling the buyer’s side of the transaction. Real estate services in Belarus can be provided only by legal entities (Companies). Realtors and agents can only work as full-time employees and provide services on behalf of a company.Currently in Belarus the commission rates for providing real estate services are fixed. The seller pays a commission fee for the services that are equal to a percentage of the sales price of the property. The rate ranges from 1% to 3%, depending on the price of the property; the more expensive the property, the lower the commission fee. Buyer pays the fees based on the services rendered. For example, property showings costs $58, drafting and negotiating an offer on behalf of the buyer is $116, facilitating the transaction and the transfer of ownership is $174, etc. Yes, ownership by foreigners is restricted and carefully monitored. Based on 2016 Census there are 28,192 dwelling units on the island and the population stood at 62,917. Many people own more than one dwelling unit. Over 25% of the population are foreigners and most are not able to purchase and so there are many rental units which supply this market, as well as supplying locals rental demands. The brokers and agents all work for the seller and owe fiduciary duty to the seller. Generally speaking the seller pays the commission however Net sales happen in which the buyer will pay the commission. Yes, there are licensing laws in effect. All brokers and agents have to be licensed. Licenses are renewed in September each year. A new regulatory framework was put into place in 2017 and Bermuda Real Estate came into scope for AML/ATF purposes and this includes requirements for continuing education. Not at present. Listings are shared using a recognised system of co-brokers. Do agents pay referral fees? If so what percentage of your commission is paid? Referral fees are paid to overseas referring brokers generally this is a commission of 15% for the side of a transaction in which they are involved. After an accepted offer Sale and Purchase Agreements (SPA) are drafted and approved by each party’s attorney. A Purchaser may request to have a structural survey done but it is not a general requirement of sale. Once these are agreed they are signed by all parties and a 10% deposit is lodged. These contracts are then stamped and distributed. After various legal searches the property is scheduled to close on the agreed date. Immediately after closing funds are transferred to the seller’s attorney for distribution and commission is paid to buyer and seller brokers. The market is stable and driven by market forces of supply and demand. There are no restrictions for Brazilian citizens. Urban areas – no restrictions for foreigners. Rural areas – some restrictions: non resident foreigners can buy rural areas if they intend to live in Brazil ( max. three years from date of purchase). Areas close to international borders and some coastal lands: restrictions to foreign buyers. According to the IBGE (Brazilian Institute of Geography and Statistics) that performs the PNAD (National Survey by Household Sample), there are a total of 60 million houses in the country, which represents 88% of the total domicile in 2015. Of the 60 million houses, 16% are rented, 7.5% are assigned, 76.2% are owned and 0.3% are in other conditions of occupation. Is there exclusive representation in Brazil? Who is the party represented (buyer, seller, both)? Most Brazilian real estate agents don’t practice exclusive representation. This is slowly changing, as some franchisees (Re/Max, Century 21...) are introducing that practice. Both parties may be represented, but usually the seller is in most cases. Yes. The Real Estate Agent profession in Brazil has a specific law (6.530/1978) that gives the general standards of performance and licensing. The license is granted by a Federal Autarchy (COFECI/CRECI System), which has headquarters in each of the 27 states of the country and establishes, through Resolutions, the main working guidelines and the Code of Ethics. Academic requirement: after a full second degree, a short specific course and a final exam, which lasts around 6 months and a professional internship, assisted by an accredited broker. There is no MLS in Brazil. There are several real estate portals from private companies. Referral is not common in Brazil. When two agents work together (one representing the seller and the other, the buyer), the comission is shared (fifty/fifty), unless another deal has been negotiated. The antitruste laws in Brazil don’t allow the real estate agents to have a set comission percentage. It usually varies between 3% and 6%, and is paid by the seller. All documents are printed in Portuguese. The first document is a contract, wich expresses the description of the property and the conditions of the payment. After that, buyer and seller go to a notary office (“cartório” or “tabelionato”), where the notary will print the “Escritura” and the payment might be completed. The next step is to register the “escritura” at the “Registro de Imóveis”, another Notary Office. Only then, the transaction is concluded. Brazilian real estate has huge potential, either because of the housing deficit (7.7 million) or because of the high number of rented properties. The Exchange rate is usually good for foreign buyers with strong currencies, like the USD and Euro. No. Only for the land - This ownership is allowed only for the citizens of the European Union or through a company registered in Bulgaria. About 85-88 % - actual statistics by Eurostat. The exclusive representation is not well developed as there is no regulation of the business in the country. But it is a practice - it could be from each one party or both of them. In Bulgaria the commission is paid by the seller or the buyer or both parties - no limit, no regulation. If one broker represents both parties he/she is free to charge each of them for commission. If each party is represented from a personal broker, each client pays to his/her representative. No regulation, no licensing. There is a state diploma which is not obligatory. The education can be provided by each one registered Educational center, the exams as well. But in the reality only the National Real Estate Association provides exams and serious education. The diploma is for life, as it is not a license. In the country there are several mail Real Estate portals - opened for professionals and owners as well / mixed /. There is no limit to publish ads in this portals which create a lot of problems for the professionals and ethical business. The National Real Estate Association together with a private technology company is working on a project for professional MLS limited only for professionals and portal also limited for professionals, banks, developers and public sales. It is expected to be in action till the end of 2018. There is a practice for referrals but it is not common because each party pays a commission in many of the cases. It is more acceptable for collaboration between brokers working in different cities - they pay 20-30% referrals when exchange offers or clients, because it is difficult to manage the process of selling or buying if your business is not based locally. But for the purpose of MLS the National Real Estate Association is trying to educate brokers and agents to use referrals as a good practice. It is connected as well with some market practice changes as: to educate the clients why the seller shall pay 6% commission instead of the common one of 3% and how to educate the brokers if they get referrals from co-brokers do not get commission from the client. This process is very difficult because there is no professional regulation and already the market is in some practice. But the advantage of NREA in the last 4 years is high and we believe with the support of NAR and CEPI we will put in some regulation the professional and market relations. We expect the new technology changes to reflect on the relations between clients and professional and NAR’s support will keep us informed on future trends and how to protect our profession and business. In Bulgaria the obligatory document to turn over the ownership is the notarial deed. If the property is acquired by judgement the verdict must be registered in the Notarial service structure / Registry agency. For public sale in case of bad credits or litigation the issued document also must be registered in the Registry Agency. In Bulgaria there is no title insurance. The notary has a professional insurance. The commission is paid as referenced above. The once strong and real professional association in the country is the National Real Estate Association. All the professional members of NREA work under ethical standards which have been updated in 2018. NREA is a member of NAR, CEPI, FIABCI, IESC, Bulgarian Chamber of Commerce and Industries and has a close relationship with the Russian Guild of Realtors, АСНУ, Serbian Real Estate Cluster, and others. NREA has 26 years of history, public respect, journalist and institutional support and international positive reputation. Our members growing and we try to educate them in more ethical practice. The land is public, the urban land is state-owned. State-owned land can be transferred for a certain number of years to build commercial housing, for example, residential land is 70 years. Citizens can purchase commercial housing, own housing ownership and land use rights, and can be freely transferred. According to the property law, the land use rights of residential land will be automatically renewed after the expiry date. Automatic renewal afterwards. And the land can be expropriated by the government. According to Article 2, paragraph 3 of the Land Administration Law: “the state may be expropriated for collective land in accordance with the needs of the public interest”, the ownership status of land ownership cannot be changed. The foreigners who work and study in China can purchase self-occupied commercial property, no special restrictions for the property ownership. Is there exclusive representation in China? Which party is represented (buyer, seller, both)? Yes, but very little. Most sellers like to entrust his apartment to several agents in different agency companies, and the only agent who sold the seller’s apartment can get the commission. It’s different in different cities. In most cities, the buyer pays the commission fee. Because the seller has more advantage in the transaction. In China, the license of real estate industry mainly includes architects, planners, appraisers and so on, if people doing the work in the field, they must get license first. Brokers or Agents are also national qualifications, but not every city asks each agent to own the qualification, some cities require that each store have one staff member with the qualification. CIREA is in charge of the national qualification exams for Brokers or Agents, and also for their registration, furthering education. Every 3 years, 120 hours, mainly through the website courses. We don’t have MLS established by the government or our association in China, some real estate agency companies have the system to share the information between their franchised outlets. The clients don’t need to pay referral fees, the agents should pay data flow charge to the website. It’s rare for the property right insurance in China. The commission is paid to the agency company, in China, the agency company representatives the seller and buyer. The government can use eminent domain to private property owners to replace for a service that fills a social need. There is high regard when a builder is proposing any type of residential or commercial project to prevent and protect fauna and flora damage. There is the need to engage in formal previous consultations with tribes and rooted peoples in projects that affect tribal land or sacred places. Land can also be temporarily seized in times of war. There are regulations based on zoning, land use and restrictions for any type of construction. Two types of easements, government related services need, and easement liens. Colombian culture is to pay cash to purchase properties although this is changing. More homeowners are getting mortgages to acquire property, but pay them off in less than 10 years. New properties offer 80% loan, used properties 70%. In Colombia family protection prevails over any type of property foreclosure on the homestead property if there are kids 18 years or less. In Colombia we have one main type of residential governing body which is horizontal property. Individual rights are limited in this commonality. In Colombia a foreigner has no restrictions when they buy property. The sale proceedings have no additional taxes, are the same as any Colombian citizen. Source: DANE - ENCV 2015. Cálculos: Economía Urbana. Is there exclusive representation in Colombia? Who is the party represented (buyer, seller, both)? In Colombia there is a tradition of having no exclusive representation and a homeowner or seller can engage any number of agents to promote the sale of their property, however, FEDELONJAS implemented in 2018 the official MLS, and is trying to educate agents and local Associations to spread the word and promote the benefit of the MLS, which involve exclusive agent representation and commission sharing. Generally, seller is the party represented. In general, the commission is paid by seller, but decision about who pays the commission fees is totally contractual. Nowadays, there are not licensing laws to regulate the real estate industry, except for leasing agents for urban housing. FEDELONJAS is working with the different regions to define a general bill to present to congress and lobby for a real estate´s licensing law. This effort will require cooperation not only from the local associations, but also from NAR and other international allies. Is there an MLS or other shared listings site in Colombia? Yes, Fedelonjas and Realty Server implemented and created the website www.mlsinmobiliario.com.co, in which information is shared between real estate agents and brokers from different cities. There are several portals used in Colombia for the purpose of consumer searches, the two most used are www.fincaraiz.com and www.metrocuadrado.com. Yes, until 50% of commission for agents in our MLS system. For international agents who refer a client varies from 10 to 25%. Describe the real estate transaction process in Colombia. For example, do you have closings or is the property turned over upon contract signing? Do you have title insurance? Are commissions paid to buyer’s and seller’s agents, only one side, or neither? Colombia uses a registration of deed system. The first step to assure the property title is clean, is to get the property´s record certificate or "Certificado de Tradicion y Libertad," which is a government official document for title. With this information, the contract is negotiated, and the execution of the deed takes place at a Notary Public, which in Colombia are run by attorneys and only authorized for executing property deeds. Closing happens when the deed is recorded in the official property record. Commissions are paid either at the contract of the Promise to Sell or the property deed, with the initial payment, or can be negotiated by the parties involved. the government offers subsidies for affordable housing programs through projects and is very efficient. These programs work directly with government or a similar figure as Federal Credit Unions regulated for the purpose of these assistance. There is property taxation (transfer taxes, property tax, condominium fees for apartments, taxes on rental income for rental investments, taxes on the added value for second homes, taxes on real estate wealth). There is no restriction for foreigners who want to buy in France. According to INSEE, as of January 1st, 2016, 57.8% of French households are owners of their home. More precisely, 37.9% have finished paying their housing, and 19.9% are still paying for it. The exclusive mandate exists, but it is rarely (around 10% of the time) chosen by the seller. Sellers and buyers are both represented. In France, real estate agency fees can be either the responsibility of the seller or the responsibility of the buyer. In both cases, they are added to the property price that the buyer pays, so in the first case the buyer pays the price + the fees directly to the seller, who will give the fees to the agency. In the second case, he or she will pay the price to the seller and the fees directly to the agency all by him or herself. This doesn’t change anything for the seller but the second case is the better one for the buyer. Indeed, he also has to pay notary fees that are calculated on the price of the property. In the first case, this price includes the commission fees. In the second, it doesn’t. Reply: Yes, real estate agents must hold a professional card (the absence of a business card exposes them to a 6- month prison sentence and a € 7,500 fine). A financial guarantee is in principle compulsory for real estate agents who hold funds, securities or securities for their clients (a security deposit, for example), except their remuneration or commission. Finally, a continuous formation of a minimum duration of 14 hours per year (or 42 hours during 3 consecutive years of exercise) is mandatory for real estate professionals holding professional real estate professional cards, people who manage an agency, employees and sales agents employed as real estate negotiators. There is Bien'ici, which regroups several companies, networks and unions, including FNAIM. However, most real estate ad sites are private, and are managed by private companies. As real estate market is very heterogeneous in France, there is no real main portal for consumer property searches. The agency doesn’t pay any notary fees, only the buyer does. The buyer pays a percentage of the price of the property; 8% if it is an old property and between 2 and 3% if it is a new property. The buyer makes a purchase proposal to the seller. If the seller accepts it, he agrees with the buyer: the sale is reserved for him, but he will only get the keys the day of the final signature / closing. The real estate sale has to take place at a notary office. A promise to sell (or before contract) is signed approximately 2 months before the final sale. During this time, the buyer has to find a way of financing the property. Real estate agent only intervenes if the seller or the buyer has used his services, which is the case most of the time. Is there any other information the world should know about your real estate market? or even decreasing, as others are still in their expansive phase. Despite big cities like Paris, Marseille or Lyon, there are more houses than apartments in France, which is due to the historical structure of the country. Most homeowners have finished paying for them. A large majority of properties are old and being renewed, with the State encouraging in many ways. According to INSEE, 16.8% of households live in public housing. FNAIM’s Real Estate Market Report as of January 2019 looking back on the 2018 Market. Most properties in Greece have no time limit on the period of ownership («Freehold ownership»). Most parts of the country are officially recorded in the Cadaster. Properties and building in Greece are designed and built based on the European standards and regulations regarding earthquake-resistant construction. The property market in Greece is fairly straightforward. According to the Law, foreigners regardless of nationality, can buy properties in most locations. Property buying restrictions apply only in border areas (East Aegean, Dodecanese Islands, Crete, Rhodes, regions of northern Greece) for citizens of countries outside the European Union who have to apply to the Prefecture Council for a buying and selling license, which is provided after a background security check of the applicant. As an EU Citizen, in case you wish to purchase property in a border area (East Aegean, Dodecanese Islands, Crete, Rhodes, regions of northern Greece), issuing a temporary residence permit (Blue Card) is required. The application may be submitted by you or an authorized lawyer at the local police station. The Blue Card is a standard procedure for all EU nationals. As a non-EU Citizen, restrictions apply only in border areas (East Aegean, Dodecanese Islands, Crete, Rhodes, regions of northern Greece), according to Law 1892/1999. To make the purchase, you should contact the local Prefecture Council to issue a purchase permit. Please note that the permit will be issued following a background security check on the applicant. Prerequisites documents to purchase property in border areas for citizens of countries outside the European Union. *To purchase property in other regions of Greece, you do not need any special permission. Home Ownership Rate in Greece decreased to 73.30 percent in 2017 from 73.90 percent in 2016. Home Ownership Rate in Greece averaged 75.43 percent from 2003 until 2017, reaching an all-time high of 77.20 percent in 2010 and a record low of 73.30 percent in 2017. Is there exclusive representation in Greece? Who is the party represented (buyer, seller, both)? *Brokerage firm may represent both parties - Dual Agency (might have two separate agents at the same RE brokerage firm). Not obliged to disclose in writing. Commission is usually payed by both parties on the actual sales value, for purchase 2 – 3% plus 24% VAT or only by seller 4 – 6% plus 24% VAT. Landlord/Tenant - Commission is usually payed by both parties on the actual value; one month’s rent plus 24% VAT. Articles 197 – 204 of Law Ν. 4072/2012 (ΦΕΚ Α 86/11.04.2012), and articles 703 - 707 of the Greek Civil Code are the governing regulation for the licensing of Real Estate profession. Education and exams are not required neither is renewal. At this time there is no MLS in Greece since most listings are not exclusive. However, HAR members seek to exclusively represent sellers and buyers. Yes. Two Brokerages can cooperate bilaterally by signing a Referral Form (referral fee is up to 30%) or Cooperation Agreement (commission split 50% - 50%). The property is turned upon signing The Property Transfer Contract. In Greece there is no Title Insurance, as in the US. Please do not hesitate to contact us for any further information. For sale on the actual sales value for purchase 2 – 3% plus 24% VAT or only by seller 4 – 6% plus 24% VAT. Landlord/Tenant - Commission is usually paid by both parties on the actual value; one month’s rent plus 24% VAT. FMA (Property Transfer Tax) - FMA 3% and is calculated by the notary based on the property value referred to in The Property Transfer Contract, and is paid at the tax office prior to signing The Property Transfer Contract. For newly constructed buildings if the construction permit was issued after 31.12.2005, the FMA is converted to 24% VAT. Lawyer: The lawyer's fee amounts to 0.5 - 2%, calculated on the property value. Notary: Notary costs amount to an average rate of 0.65 - 1.2%. Land Deed Registry: The expenses of Land Deed Registry amounts to 0.475% of The Property Transfer Contract value. *From 2013 and 2014 significant foreign investments were realized, due to the attractiveness of Greek asset prices, the willingness of Greece to recover its economy and the Return on Investment potential (Investment Law «Fast»). There are no restrictions in case of real property that does not qualify as agricultural or forestry land. Dual citizens, if one of their citizenship is Hungarian or they are citizens of an EEA/EU member state. Other natural or legal entities may obtain the ownership of real properties exclusively with the permission of the competent Hungarian authority. 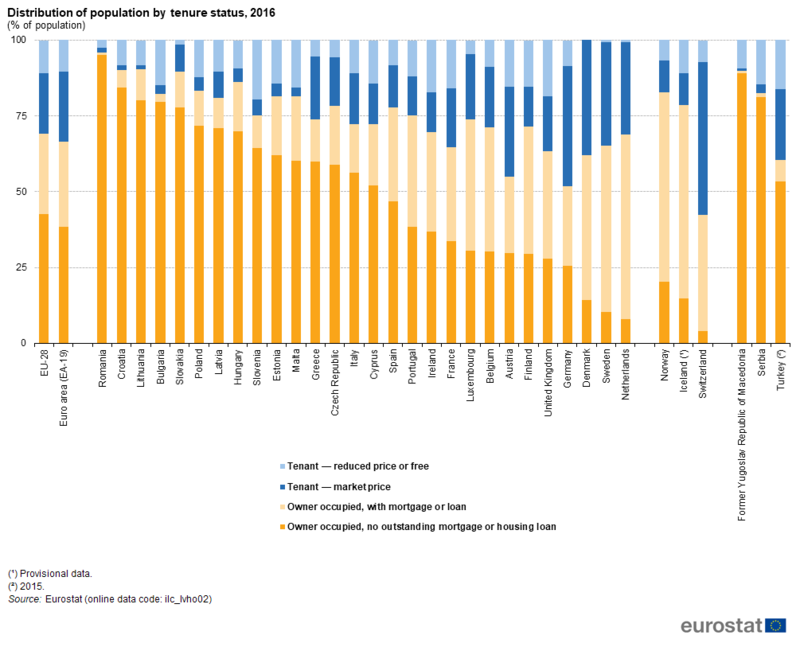 A little more than 86% of Hungarians own the homes they live in, well over the European Union average of 69.4%, according to the latest data compiled by Eurostat, the EUʼs statistics office. Is there exclusive representation in Hungary? Who is the party represented (buyer, seller, both)? Yes, the seller is represented. Yes, there is licensing. The issued licenses do not need to be renewed. Describe the real estate transaction process in Hungary. For example, do you have closings or is the property turned over upon contract signing? Do you have title insurance? Are commissions paid to buyer’s and seller’s agents, only one side, or neither? Prior to the conclusion of the sale and purchase agreement, due diligence is normally carried out. After a sale and purchase agreement is entered into, an application for the registration of the change of ownership is to be submitted to the appropriate land registry office. The transfer of ownership takes place when registration is completed by the land registry office. Title insurance is available, although it is very rarely obtained by purchasers, largely due to the fact that the land register is very reliable in Hungary. Usually commissions are paid to seller’s agents. Is there exclusive representation in Ireland? Who is the party represented (buyer, seller, both)? A broker can only represent one, but can choose either buyer or seller. Yes, we have a government licensing system. The minimum education requirement is i20ects in a set educational matrix set by the property regulator. Possibly on a case to case basis, as a % of the commission; or on a one-off depending on the size of the sale. The sale closes when agreed with the solicitors acting for both seller and buyer, about 1 month after unconditional contract is signed by both parties. Title insurance is not commonly used. Commissions are paid most commonly to seller’s agent. There is no restriction on the ownership of citizens of the Israel. There is a restriction for foreigners on part of the Israel's land and a special permit is required to purchase such a property. 67% are homeowners in Israel (according to the Central Bureau of Statistics). There is an exclusive representation for sellers of residential properties in Israel, limited to 6 months for each period of exclusivity. There is no exclusivity on buyers. In Israel, sellers and buyers pay brokerage fees. Brokers in Israel must undergo an examination in order to obtain a license from the Ministry of Justice and renew it every year with payment. There is the Law of Brokers, which was enacted in 1996, which defines the limitations and laws of practice in brokerage. Is there an MLS or other shared listings site in Israel? Jerusalem is the only place in Israel where there is a formal MLS that is operated by an external company and recognized by the Chamber of Real Estate Brokers of Jerusalem. The "Yad 2" and "Madlan" are the largest and most important property portals in Israel. We typically pay a referral fee of: 20-25% of the customer's fee, seller or buyer. The process of closing the real estate deal in Israel is done only through the lawyers, the broker in Israel is forbidden to do any action related to the legal side. Brokers close the economic side of the deal: price, payments, dates. When the contract is signed, the first payment is given to the owner directly from the buyer during the signing meeting and a warning mark registered on the title. A report is submitted to the tax authority regarding purchase-tax of the buyer and appreciation-tax of the seller (if required) + the owner needs to bring a permit from the municipality that there are no taxes or debts on the property. Delivering the key is against the last payment and then the property is transferred on the buyer's name in the title. In Israel there is no difference between an agent and a broker in terms of license. There is no training for office owners and any licensee can open and manage a real estate agency. In Israel a broker can represent and get paid from both side of the real estate deal, so does the lawyer in the deal. There is no limit on the brokerage fee but it is common: 2% + VAT from each side, buyer and seller. There are restrictions according to EU anti-money laundering laws. Real estate agents work for both sellers and buyers, representing an independent professional profile. The real estate profession in Italy is regulated by the law of the Civil Code with the articles numbers 1754 and 1755 and by specific law n. 39 of the year 1989. Professional real estate agents must pass an exam (both written and oral). After they have to subscribe into the local chamber of commerce showing the mandatory insurance policy. Real estate agents must also have an Identification card issued by local Chamber of Commerce and an Insurance policy. Our federation FIAIP offers to its members the Insurance coverage with a very convenient annual fee with a minimum coverage of 260,000.00 Euros. Yes there is. Our Federation has a very important tool for connecting its agents named MLS FIAIP. The main property portal in Italy is www.immobiliare.it. We do, the average is 10% calculated on the total amount of the commission fee. In the selling of real estate assets everything has to be written (both purchase binding offer and the consequent acceptances). The property cannot turn over upon a signed contract. If the seller withdraws his signed acceptance has to pay twice the deposit received; if the buyer withdraws his signed offer (walks away) he loses the wired deposit. If two different real estate agents cooperate together in a transaction deal, one representing the seller and one the buyer, they will normally share the total amount of the fee (50/50). There is no ownership rate on the first house in which the owner resides. On the second houses the taxes are established at the municipal level and the percentage can vary within a range established by the government. There are no restrictions for foreigners to own real estate and foreigners have the same rights as Japanese do. However, Japanese law allows government to set restrictions for foreigner ownership at the same level as the foreign country’s foreigner ownership rule. It is written in Japanese “Foreigner Land Law” but the rule has never applied. According to the survey in 2013 by the ministry of statistics, the home ownership rate in Japan is 61.7%, the number of owned home is 3.2 million. 35.5% borrows home from home owner. Is there exclusive representation in Japan? Which party is represented (buyer, seller, both)? There are 3 types of representation on Japanese real estate law. The more exclusive, the more responsibility and duty for the real estate agent. It is common to conclude Ippan mediation contract when buyers ask for help in finding a home. For sellers, it depends how they want to advertise their property. The more a contract type is loose, the more the property is spread. Buyers pay the fee to buyer’s broker, and sellers pay to seller’s broker. In Japanese real estate transaction law, the commission fees are regulated as “3% of transaction price + 60,000 ￥ + Tax (current consumer tax rate is 8%）at maximum. If a broker represents both buyer and seller’s side, the broker can take 6% + 120,000 ￥ + Tax at maximum. Representing both sides is legal in Japanese real estate transaction law. The Japanese broker’s license needs to be updated every 5 years. In order to update broker’s license, you need to participate in a 5-hour class with curriculum determined by government. The class costs about 100$, and costs 50$ to republish broker license card. In Japan, the broker license card is necessary because you need to bring the broker license card when you explain important information about a property. Some real estate companies pay for the cost because it’s necessary for them as well. Yes. “REINS (Real Estate Information NetWork Systems)” is a shared listing system for Real Estate agents. REINS are operated by institutions that are authorized by the Japanese government. There are 4 REINS operators in Japan divided by area. An agent becomes a member of REINS through his/her RE association. Note: Although REINS is designed as an MLS system, it does NOT function as a search engine for professionals due to lack of data integrity and policing (not as strong as MLS). Yes, the referral fee is determined by the individual agent/broker. Japanese construction cost is gradually increasing due to construction demand caused by serial natural disasters and TOKYO Olympics. According to the ministry of land, infrastructure, transport and tourism, general construction cost increased up to 110% of 2011’s price. In principle, there is no restriction on ownership for citizens. However, Laws and ordinances of government restrict what you can do with the real property or land that citizens own. 원칙적으로, 소유 제한을 하지 않는다. 하지만 정부의 법률 및 조례는 시민이 소유하고 있는 부동산으로 할 수 있는 일을 제한한다. For foreigners, it is required to obtain permission for the military facilities and protection facilities. 원칙적으로 소유 제한을 받지 않는다. 외국인에 대해서는 군사시설 보호시설 등에 대해서는 허가를 받아야 한다. Is there exclusive representation in Korea? Who is the party represented (buyer, seller, both)? Both buyer and seller pay the commission fees of each real estate agent. 매도자와 매수자 모두 각 중개사에게 보수를 지급한다. Are there licensing laws/government regulations of the real estate industry? If so, what are the renewal/ continuing education requirements? Any person who intends to be a certified real estate agent shall pass a qualifying examination for licensed real estate agents administered by a Mayor/Do Governor. Representative licensed(certified) real estate agents who has brokerage registration number are required to take the in-service training every two years. Employed certified real estate agents are required to take the in-service training every two years. Brokerage assistants are required to take the job-training within one year before the employment date. 공인중개사가 되려는 자는 시ㆍ도지사가 시행하는 공인중개사자격시험에 합격하여야 한다. 등록번호가 있는 대표공인중개사는 2년마다 연수교육을 받는다. 중개보조원은 교육날짜 1년 이내에 직무교육을 받는다. Hours of education: At least 28, but not exceeding 32 hours. Hours of education: At least three, but not exceeding four hours. Hours of education: At least 12, but not exceeding 16 hours. Other standards and procedures necessary for conducting balanced education. KAR(Korea association of Realtors) operates ‘Hanbang’ website and mobile app. 한국공인중개사협회에서는 한방 웹사이트와 모바일앱을 운영하고 있다. There is ‘Hanbang’ website operated by the KAR. ‘Naver’ and ‘Daum’ are commonly used as property website. 한국공인중개사협회에서 운영하는 한방 웹사이트가 있다. Analysis on real property titles. There is no involvement of attorneys throughout the real estate transaction deal. 중개계약과정 전반에 변호사의 개입이 없다. The term "brokerage assistant" means a person affiliated with a practicing licensed real estate agent, who conducts uncomplicated services incidental to the practicing licensed real estate agent's brokerage business, such as leading clients over the places where the objects of brokerage are located, conducting general affairs, etc., without holding a real estate agent's license. Are there restrictions on property or land ownership for citizens of Latvia? There are no ownership restrictions in this regard for citizens, yet property development restrictions apply in certain protected areas. There are restrictions and certain requirements regarding agricultural land and forested areas. Is there exclusive representation in Latvia? Who is the party represented (buyer, seller, both)? Normally, the exclusive representation is signed for seller. Normally, it is paid by the seller yet it depends on agreement between the involved parties. So far there are no licensing laws or regulation of the real estate industry or real estate agent’s activities, except for the Commercial Law applying to business entities in general. However, an agent may become a member of the local professional association LANIDA, take the exam voluntary and get a real estate agent certificate yet, sadly, this fact does not bring many privileges over uncertified middlemen who damage reputation of the professionals. Therefore it is a struggle for realtors and urges a regulation. LANIDA arranged a work group of the leading market professionals to develop and submit a proposal of a licensing law project to the government, and awaits response from the government. Normally, real estate agents use two property portals for property advertising, cooperate gladly and share the commission when it comes to a so-called shared transaction between the seller’s and the buyer’s agents. Several years ago, there was an attempt to introduce MLS in Latvia. Being a new practice to the recently developing market (it has a history of 27 years only at present), MLS failed in Latvia as the people hardly accepted exclusive representation and many sellers helped themselves (and still do so) for the sake of saving on commissions to agents. It is still a struggle in Latvia to change people’s mindset in this respect though trust in real estate agents grows and involving reputable representatives in property selling process is a more frequent practice now. Yes, we do. Agreement with a referral agent can be signed for up to 25% of our commission. … mortgage agreement (if the buyer needs to borrow from a bank). Having survived the economic boom, the bubble burst and the global crisis that hit ten years ago, the Latvian real estate market has come to a convincing stability with a moderate growing trend over the recent years. Now, the market situation is favourable for investors as the market still develops, and the real estate prices are fair. Investors have certain allowances, and there are favourable requirements to get a Schengen residence permit through buying real estate or investing not only in real estate but in business in general. Yes, they can own properties limited to 3000 square meters. It can be done upon agreement of the parties. No, there are no licensing laws at this time. Is there an MLS or other shared listings site in Lebanon? Only internal to the syndicate members. The transfer of ownership is done when the contract is registered in the cadastral register. Two sides, the agent/broker can represent the two sides or one side. Are there restrictions on the ownership or ownership of the land for the citizens of your country? No, although you have to take into account the use of land, if it is commercial, ejidal, housing and your deed protects the property. Are there restrictions on the property of foreigners? Yes, on beaches 50 km from the coast / Borders 100 km and are only through bank trusts. Is there exclusive representation in Mexico? Who is the represented party (buyer, seller, both)? Yes, we have exclusive representation and can be for both. It is mainly the seller who is represented, although the buyer also exists to a lesser extent as represented. The owner and / or seller. Are there licensing laws / government regulation of the real estate industry? If so, what are the renewal / continuing education requirements? There is no Federal Law, but each state has different processes to regulate the real estate industry. In almost all States it is necessary to keep in constant training and updating to collect the required score and be able to renew the license, AMPI through the CCIE has a portfolio of training and federal certifications to support members to renew and generate in the new advisors certainty to obtain their license. For example, in Sonora to obtain a 3-year license, a course or diploma of 120 hours is required and for renovation, 30 hours of training are required. What is the main property portal for searches for consumer goods? The portals of each section in AMPI or portals such as Inmuebles24, Vivanuncios, Easy Broker, etc. Do you pay reference fees? If so, what percentage of your commission do you pay? If they are paid and these vary according to the State and operation. These can range between 10% to 50%. Describe the real estate transaction process in your country. For example, do you have closures or the property is delivered when you sign the contract? Do you have title insurance? Are commissions paid to the agents of the buyer and seller, only one side, or neither of the two? The property is delivered until the signature of the public deed and total settlement of the property. The commission is paid until the signature of the deed is executed before a notary and the property has been delivered to the satisfaction of the buyer. Title insurance does not get used. We have a strong, growing and strengthened market, which means a good investment opportunity. It is essential to know the way of payment of a property for the time of making the operation to know if it will be in cash, or bank financing. Mexico is seeking to have a Federal Law to facilitate business operations. It is important to carry out your real estate transactions with professional real estate consultants to avoid bad experiences. Some of the AMPI Chapters uses MLS, escrow accounts are used wherever possible, they handle prices in dollars in vacation spots, and we are a very attractive market for foreigners. 57% in 2017. The percentage is lower in the big cities. Yes. Buyer or seller, but not both for the same object. Each party (seller or buyer) pays for his own representation. No legal obligations, but self-regulation. Real estate agents who are member of a branch organization (NVM, VBO Makelaar or VastgoedPRO) are obliged to be certified. There are two certification organizations: VastgoedCert and SCVM for realtors. There is one for valuers: NRVT. Part of certification is a permanent education requirement. There is a listing fee. Buyer and Seller reach an agreement. This agreement is only legally binding when put in writing. Parties sign a contract. There is a legal three-day period after signing in which the buyer is able to reconsider without consequences. When the property is turned over a turnover contract is signed at the notary and the ownership is registered at the Kadaster. Each party pays commission to his own realtor. There is a 2% transaction tax to be paid by the buyer. The rental sector is heavily regulated. 30% of the entire housing market is social housing. 14% is privately owned, but about half of that is regulated (rent control). Only about 6-7% of the housing market is privately owned and unregulated (no rent control). Limited restrictions. Foreigners cannot own property within 3 miles of the border separating Nicaragua from its neighbors. The seller pays the commission fees. Limited licensing. Not heavily enforced. Should be every 2 years. Is there an MLS or other shared listings site in Nicaragua? Closings do exist. They are usually performed in lawyers’ offices. No title insurance. Commissions are paid to seller’s agent and this agent hands over to buyer’s agent. Nicaragua is becoming more organized and more professional. A total of 77 percent of households own their homes, while 23 percent are tenants. Normally the seller hires the real estate broker. The real estate brokers are required by law to act in accordance with good real estate practice and to be an independent third party to every transaction. This means that they are required to provide both the seller and the buyer information that is relevant in the sale process, and to help them enter into a balanced contract. The real estate brokers in Norway are by law required to represent both parties – not just the seller or the buyer. The person hiring the real estate broker pays the commission fee. Normally the seller is the person hiring. Yes. Real estate brokers need a bachelor degree, and in addition they need 15 hours of continuing education every second year they practice as a real estate broker. Referral fees are not common, because the buyers normally aren’t represented by a real estate broker. The seller hires a real estate broker. The real estate broker then puts the property on the market, after gathering all required information about the property. The real estate broker is required by law to give the buyer all the information about the property that is relevant in the sale process. The real estate broker normally hosts an open house, so everyone interested in the property can take a closer look. The potential buyers normally show up on these open houses without representation. If someone then wants to put in an offer they can do so, but the first offer has to be valid until 12.00 the first working day after the last open house. All bids normally have an acceptance period and all offers must be in writing. By Norwegian law the bid can’t be withdrawn after it has come to the seller’s notice. (A bid is binding to the person giving it by the time it has come to the recipients notice). If the seller accepts the bid within the acceptance deadline, the seller and buyer have made a binding agreement. Neither can then withdraw from the agreement, and the buyer and seller then meet to sign the contract. Normally the buyer takes over the property sometime after the contract is signed (normally 3 months). The Seller pays the commission. Government regulates the activity by law. It is mandatory to have a broker’s licence to do any property sales or buyer intermediation. Yes. Acobir has an MLS. Encuentra24 is the main portal, and ACOBIR is working to promote the MLS website as the reference of the market. The regular portals use to publish properties by owners, brokers and others items. Yes. It depends. Usually is 25%. Describe the real estate transaction process in Panama. For example, do you have closings or is the property turned over upon contract signing? There is a closing process. Yes, however is not a usual practice. Are commissions paid to buyer’s and seller’s agents, only one side, or neither? Stable with US dollars as currency of Economics. The real estate sector has a lot of options of projects for invest in. No natural disasters such as hurricanes or earthquakes. Enjoys a tropical climate with the rainy season and the dry season. Compared with other Latin American neighbors, is a safe country. The cost of living is lower and the quality of life is high. There are exemptions and discounts for retirees and the elderly, which would be similar whether it is a foreign resident in Panama retired as if he is a national. These include discounts on land and air transport, in cinemas, medicines, restaurants, shopping and services. Diverse geography, with virgin forests, mountains, tropical islands and a great modern capital with urban development and all the facilities. High levels of vocational training in sectors such as medicine, law, banking, among others. There is little interference from local authorities. As additional benefits, can speak of exceptional fishing, diversity of fauna and flora, shopping centers, modern hospitals and laboratories. Investing in Panama has the advantage that it is considered a tax haven. Revenue generated within the country, including those that generate sales made within Panama, it does support the Panamanian tax, because the tax law is based on the principle of territoriality. Panama offers special visas that allow tax breaks for foreigners living or investing in the country. There are no restrictions for local citizens to own property. There are no property restrictions for foreign citizens except for some regulations in border regions only for rural properties. There is about a 70% home ownership rate, which is declining. Exclusive representation exists, however it is not common use. The seller tends to be represented more often when exclusivity does exist. Normally the seller pays commission fees based on the selling price of the property. There is no regulation of the real estate industry. There are shared listing sites, however they are still not emerging or primary sites. The main search portal in Paraguay is CLASIPAR, followed by INFOCASAS. Referral fees are paid. Although there is no specific commission percentage, it would generally be in the range of 10-25% of commission. The market’s sales commission tends to be 5% of the property’s closing price. The seller pays commissions at the time of the closing. Typically it takes 45 to 60 days to complete notary and deed process. Title insurance is not common. Notary and deed expenses are normally from 1.5 to 2% of closing price. Paraguay is one step away from getting investment grade (BBB) rating, it presents a clear opportunity in terms of price and liquidity for coming years; the market tends to be closed to the idea of granting exclusive representation and licensing is now in discussion in our chambers of commerce and national senate. Provided by PIRA (Portuguese International Realty Alliance), one of NAR’s two bilateral partners in the country. No. In fact, they are welcomed. In 2001, 76% owned a home. Today it’s expected to be more than 85%, due to the boom mortgage cycles. Dual agency and open listing are traditional and more frequent. Exclusive representation represents around 30%, mainly seller, but buyer agency as well as a more recent trend. Yes. In 2013, Law 15 was approved that states that the license maybe collective (Broker) or individual (agent) but in both cases the requirements are similar. One needs to apply for an AMI License at the Government Institute (IMPIC) providing evidence of a clear criminal record, proof of civil liability insurance and location of its establishment. To renew it you have to follow the same process. There is an annual mandatory education course on Money Laundry Policy plus 35 hours of annual professional education courses. No public MLS exists besides the ones belonging to Real Estate Franchise Networks such as REMAX, KW, ERA, Century 21 and ComprarCasa. Do agents pay referral fees? If so, what is the commission percentage? Yes. Around 50% of the side. Describe the real estate transaction process in Portugal. For example, do you have closings or is the property turned over upon contract signing? Do you have title insurance? Are commissions paid to buyer’s and seller’s agents, only one side, or neither? Contracts are signed with mortgage as the main contingency. The closing process usually takes 30 to 45 days. Final deeds are signed in the Public Notary, a Government officer. Portugal has had a long history of nonresidents (retired), mainly from Europe (UK) in Southern Algarve. In the last 10 years due to Government Policies regarding the Golden VISA program, many other nationalities have increased as property city buyers, located in Lisbon, Porto as well as farms in Douro or Alentejo. China, Brazil and France are the top buyers’ origin countries. It’s estimated that 20% of all property transactions in 2018 were by foreigner buyers. Property is seen as a safe and good investment helping to recover the old city centers, renewing old buildings into units with a high-priced market value. New construction is now on the rise and as prices are high in city center, the areas outside the city are now starting to attract more buyers with families. What most attracts foreign buyers are: lower cost of life, good weather, safety country, friendly people. There are no official statistics, but real estate professionals participate in less than 50% of the transactions. Yes, there are restrictions on how a citizen that has ownership over a property/land can sell it. For example, if the property is set within 30km of the national border, the citizen will need a special permit from the National Defence Minister. Or, if the citizen wants to sell over 300.000 sqms of land, the citizen will need a special permit from the Agriculture Minister. Or, if a citizen wants to sell a property which was declared historical monument, he/she will need the agreement of the Culture Minister in order to sell. Yes, the are restrictions for the non EU/EEA/Swiss Confederation citizens or citizens of the countries with which Romania has bilateral agreements on land ownership. According to the Eurostat data from 2015, Romania had the highest ownership rate in the EU, 96.5% ownerhip rate. Is there exclusive representation in Romania Who is the party represented (buyer, seller, both)? Yes, we have exclusive representation services for both buyers and sellers. If the agent works in exclusive representation, the commission fee is paid by the client who hired the agent and in seller representation, the seller agent pays a portion of the commission to buyer s agent. If the agent works open listings (which is more common in Romania), than a commission fee will be paid both by the buyer and by the seller, for the same transaction. There is no licensing law in Romania, as compared with the licensing laws in the US. There are basic requirements for a real estate agent day to day activity, but there is no licensing requirement to become a real estate agent or to improve (educate) as a real estate agent. Yes we have Flex MLS. Yes we do, usually the referral fee will be set between 10% and 20%. Normally, the transaction process consists of a sale contract which is authenticated by a public notary, there is no title insurance and the property can either be turned over upon contract signing or in 30 days (the term can vary, based on the agreement between buyer and seller). If there is an open listing, both the buyer and the seller will pay the commission fee to the agent upon contract signing, if there is exclusive representation, as said before, only the client who hired the agent will pay the commission. There is no restriction on the property and land ownership for citizens of the Republic of Serbia. Yes, there are. The foreign citizen can own properties only if Serbian citizens can own properties in his or her country of origin. The Republic of Serbia has reciprocity in property ownership rights with more than 70 countries (USA, Russian Federation, PR of China, Japan, Israel, UAE, UAR, Egypt, Brazil, Argentina, Mexico, UK, France, Germany, Spain, Italy, Greece, Turkey, Slovenia, Bosnia and Hercegovina and almost all European countries and many other countries). Only Serbian citizens can own the agricultural land in Serbia. The EU citizens will have right to own it after year 2027. About 87% of families are homeowners in Serbia. Is there exclusive representation in Serbia? Who is the party represented (buyer, seller, both)? There is exclusive representation but percentage of exclusive brokerage contracts is very small. Both sides are paying commission. Buyer and seller/ tenant and lessor. There is a Real Estate Brokerage Law in Serbia which was enacted in 2013. All Real Estate Agents must pass a licensing exam in Ministry of Trade, Tourism and Telecommunications of the Republic of Serbia. Pursuant to the Article 7 of the Real Estate Brokerage Law, on the official web site of the Ministry of Trade, Tourism and Telecommunications: http://195.222.96.215/registarposrednika/#/registry-search are all relevant data on Real Estate Brokers and their employees - the Real Estate Agents, that meet the legal requirements for performing of real estate brokerage business. There is no MLS in Serbia. Do agents pay referral fees? If so how is it paid? Referral fees are 25% up to 50% of the customer's fee, buyer or seller/ tenant or lessor. All the Contracts and Pre-contracts, powers of attorney, legal consents, have to be certified by Notary public. If in some smaller towns there is no Notary public office and the Contract certification is done at the court. The costs of Notary public depend upon the amount of purchase price. Within the services provided by the real estate broker, lawyer’s services are included into the service and the agency fee. Real estate brokers are engaging a lawyer to make drafts of Pre-contract and Contract and sending it to the Notary public for certification, proper completion, and documentation check. A client has the right to hire separate legal assistance (if they choose) to double check the documentation and Contracts made by broker’s legal team. The real estate transfer tax is 2.5% of the purchased price, or 2.5% of the estimated value by the competent tax office, if they find the agreed price lower than the market one. By law, taxation on the transfer of real estate is obligation of the seller, however, for the past 25 years this obligation has been transferred by contract to the buyer, and in accordance with that the market prices have been set. The seller has another tax – Capital gain tax, if is not the owner of the property for more than 10 years. It is calculated as a difference between the estimated price in the moment of selling and buying price increased for costs of life from the time of purchase until the time of sales. The Capital gain is taxed by 15%. The value-added tax ( VAT) exists in Serbia since 2005th and it is applicable only to new/newly built real estate that are selling first time and where developer/investor is construction permit holder, and is in the VAT regime. VAT is calculated and is expressed as a part of selling price. If VAT is charged in the price of the real estate, real estate transfer tax will not be accounted and paid for that transaction. There is no legal limit on the brokerage fee but it is common: 2-3% + VAT from each side, buyer and seller. The Government of the Republic of Serbia welcomes foreign investors and aims to make the buying process easy and seamless. The Government subsidizes foreign investments. The rights of foreign investors are guaranteed by the Law on foreign investments. Serbia’s real estate and corporate taxes are very low. Real Estate Brokers who are members of Real Estate Cluster are knowledgeable of NAR Code of Ethics & Standards of Practice, their agents are familiar with ABR Courses and are getting certified in CIPS (Certified International Property Specialists) – to become better global partners and deliver world class service to the clients. Singapore Citizens can own private property including land in Singapore. Those who are currently staying in public housing namely Housing & Development Board (HDB) flats must occupy their flat for 5 years before being allowed to invest in private property including land. The Singapore Residential Property Act prevents foreigners and Singapore Permanent Resident (SPR) from owning landed property on the main island of Singapore. Foreigners and SPR who wish to own landed property can do so on one of Singapore's smaller island known as Sentosa. There are no restrictions for foreigners and SPR to own condominium unit(s) in any part of Singapore. According to the Singapore Department of Statistic (www.singstat.gov.sg), the home ownership rate stands at 90.7% in 2017. There are 1,289,900 resident households with an average household size of 3.3 persons. Singapore real estate salespersons can exclusively represent either party in a transaction. The Singapore Estate Agents Act Regulations prevents dual representation and those caught collecting commission from both parties in the same transaction can be fined up to SGD25,000 and/or jailed up to 12 months. Commission is usually paid by the vendors in private property transactions. For public housing HDB flats, vendors and purchasers will pay their own respective real estate salesperson if they are represented by them. Note that the same salesperson is unable to represent both parties in the same transaction. Since 22nd October 2010, all estate agencies and their real estate salespersons must be licensed and registered. An annual license fee is to be paid by estate agencies while an annual registration fee is to be paid by individual salespersons after completing 6 hours of continuing professional development training yearly. Is there an MLS or other shared listings site in Singapore? There are several MLS websites in Singapore. Some of these websites only allow real estate salespersons to advertise listings. Referral fees are sometimes paid to third parties who introduce the principal. The normal referral fee is usually 10% of the commission. A property purchase will usually take 3 months to complete. A sale with vacant possession or with tenancy will include fixtures and fittings in the property and the buyer will only get the key to the property upon the completion date of the transaction. The conveyancing process is to be handled by solicitors representing the different parties in the transaction. Stamp duties will have to be paid for the transfer of property in Singapore (see below). There are no restrictions; but there are restrictions on contractual capacity that may prevent someone from acquiring property, such as if you are insolvent/not sound of mind/etc., then you may not enter into an agreement to purchase property. There are also compliance issues before a property will be registered in a purchaser’s name, such as complying with provisions of anti-money laundering laws, requirements imposed by company law and trust law, and the like. Are there restrictions on property or land ownership for foreigners? No there are no restrictions at present, except that a foreigner, when in SA, must have a valid permit to be in South Africa. As such, if he signs an agreement to purchase property in South Africa whilst he is in the country, he must have a valid visa/residence permit. The same contractual capacity issues and compliance requirements as mentioned above (for residents), apply in addition. Is there exclusive representation in South Africa? Who is the party represented (buyer, seller, both)? There is no exclusive representation. One Estate Agent handles both sides of the transaction. The Estate Agency Affairs Board (EAAB) was established in 1976 in terms of the Estate Agency Affairs Act, 112 of 1976 (“the Act”), with the mandate to regulate and control certain activities of estate agents in the public interest; and for incidental matters. The Estate Agency Affairs Board (EAAB - www.eaab.org.za) EAAB regulates the estate agency profession by ensuring that all persons carrying out the activities of an estate agent as a service to the public are registered with the EAAB. A Fidelity Fund Certificate (FFC), which is to be renewed each year, is issued as evidence of such registration and confirmation that such person is legally entitled to carry out the activities of an estate agent. It is mandated that all real estate agents in South Africa complete a number of verifiable and non-verifiable CPD courses annually. There is limited MLS in South Africa with only 3 small areas supporting same. Amounts to less than 5% of the market. We do pay referral fees up to 20%. Occupation of the property can take place before or after transfer of ownership of the property has taken place subject to the contract. We do not have title insurance. Commission is paid to the Sellers agent. 77% ownership according to Instituto Nacional de Estadística, a Governmental Statistics Office. Dual agency and open listing is traditional and more frequent, although transitioning to exclusive representation, mainly seller, but buyer agency as well as a more recent trend. The seller in most parts of Spain, although there are some regions where both the seller and the buyer pay to their respective agents, or to the dual agent. No regulations except for Catalonia where there is an official registration required, with some education requirements, but no continuing education requirements. Other regions in Spain are moving in the same direction, but the European Community seems to be against setting barriers of entry. There is one private MLS www.mls.es operating nationwide but not very successful, and around 100 local MLSs spread all over Spain. Yes, Around 25% of the side. Describe the real estate transaction process in Spain. For example, do you have closings or is the property turned over upon contract signing? Do you have title insurance? Are commissions paid to buyer’s and seller’s agents, only one side, or neither? Spain is known as the Florida of Europe. Many Europeans own their vacation and retirement properties in the Mediterranean coasts and islands of Spain. Barcelona and Madrid also bring many foreign buyers for investment and residence. Although there are no official statistics, real estate professionals participate in less than 50% of the transactions. In most cases, the ownership of land and property is freehold rather than leasehold in Taiwan, which indicates that we don’t have many restrictions and limitations. However, with regard to zoning and related architectural laws, we still need to follow the regulations. In Taiwan, the restrictions depend on different countries. The principle of equality and reciprocity is the main concept of the ownership. Generally, foreigners can have property ownership. The home ownership rate in Taiwan is extremely high, which is approximately 85% in 2018. Is there exclusive representation in Taiwan? Who is the party represented (buyer, seller, both)? Yes, there is exclusive representation in Taiwan. And agents can present both seller and buyer side depending on situation. In our regulations, both the seller side (up to 4% of sale price) and the buyer side (up to 2% of sale price) pay the commission fees to its agent separately. There are licensing laws / government regulation of real estate industry, we need to have license to run the business of real estate appraisal, brokerage, and real estate registration. Is there an MLS or other shared listings site in Taiwan? No, we don’t have the MLS system, but the property can be viewed in different listing systems developed by major brokerage firms. Although there is no MLS database, we have the publicly accessible information system of consummated properties and prices database, created by the Taiwan Government, which provides good transparency of the property market. The most popular property searching portal would be 591 website: https://www.591.com.tw/. Yes, we pay referral fees or real estate brokerage. However, the fees depend on the negotiation and the compromise of each side. Normally, we pay 10% - 50% referral fees of commission. We don’t have title insurance company as the government agency is responsible for the accuracy and registration of real estate title transfer. In our regulations, both the seller side (up to 4% of sale price) and the buyer side (up to 2% of sale price) pay the commission fees to its agent separately. But dual agency is allowed in Taiwan. Most real estates are fee simple estate- 100% ownership without incumbency, better than right of use or ground leasehold market only. The current market cycle is on the stage of downward adjustment due to the government cooling measure policy to cool down significantly rising house prices since 2004. No, there are no restrictions for Thai citizens having property and land ownership. Is there exclusive representation in Thailand? Who is the party represented (buyer, seller, both)? Yes, there is, but it not legally representation because there is not licensing law and exclusive agent. Usually, the seller pays the commission fees. There have not been licensing laws/government regulations in Thailand yet. Therefore, there are not education requirements and qualifications for persons who will be "real estate broker/agent" in Thailand. Is there an MLS or other shared listings site in Thailand? There is no main portal for consumer searching in Thailand. There are number of websites which provide searching facility for customer such as Clickthaihome.com, ddpropperty.com, home.co.th, thaiproperty.in.th, thaihometown.com, thailivingproperty.com, hometodays.com, etc. Usually, the seller will pay about 3% for commission, and the members of agent will share partially for referral fees for the person who suggests the buyer to the agent. The real estate market in Thailand is quite big, active and high potential growth market, as compared to the ASEAN market. Only in terms of land ownership. b) outside the populated areas in case of acquisition of real estate. According to expert opinion, the volume of private property in Ukraine is 84% (link to source here). According to some data, the share of private (including privatized) property in the housing stock of Ukraine exceeds 90%. Homeownership rate (the ratio of housing in ownership and in rent): there is no official data on the percentage of homeowners. According to the information provided by the Ministry of Regional Development, 1.4 million citizens rent accommodation, although in fact many more Ukrainians are forced to rent their accommodation (many of whom are internal refugees, lack of affordable mortgage programs, decline of living standards). This market can be considered as a shadow market in many respects, that’s why accurate data is almost impossible to determine. However, considering that there are about 17 million apartments in Ukraine, according to our observations this rate is about 80%. Is there exclusive representation in Ukraine? Who is the party represented (buyer, seller, both)? Yes, the practice of signing exclusive listings and representation of the client's interests is becoming more widespread in Ukraine. As a rule, the seller is the party represented. However, unfortunately, many agents work with clients and advertise their real estate without signing any contracts confirming authority of the agents. Since the mid-1990s, almost all regions of Ukraine had practiced charging the commission from a buyer, even if the property was under the listing contract with its owner. In some large cities listing agreements with owners still do not require payment of commission fees: brokers share the commission paid by a buyer on top of the price of real estate. Lately the situation has been changing: the commission of every broker involved is paid by their client - the seller or the buyer respectively. In many cities agencies claim a commission from both parties simultaneously. The practice based on the logic of MLS partnership, when a commission fee paid by the seller to his listing broker is shared with a buyer broker, is not so widespread, but already constitutes a visible portion of the offers for the sale of real estate. First of all - in the cities with strong regional branches of ASNU: Rivne, Ivano-Frankivsk, Dnipro. No, there is neither licensing nor state regulation in Ukrainian real estate industry. Professional training on the voluntary certification basis is carried out, mainly, by two leading professional associations. Is there an MLS or other shared listings site in Ukraine? Some portals started copying the idea of MLS, introducing an exclusivity check and providing the brokerage commission sharing. It is not very popular with agents. Only ASNU is currently working on the development of a closed multi-listing service for its members under control of a public organization, based on the principles and rules of MLS. The most popular portals for real estate search in Ukraine are OLX.ua, LUN.UA. Yes, the practice of paying referral fees in Ukraine exists and as a rule is 10-20% of the commission. Describe the real estate transaction process in Ukraine. For example, do you have closings or is the property turned over upon contract signing? Do you have title insurance? Are commissions paid to buyer’s and seller’s agents, only one side, or neither? The transfer of ownership is carried out at the moment of transaction. All real estate purchase contracts are subject to notary certification. The right of ownership is registered by the State Registrar in the Register of Property Rights on the basis of a purchase contract on the day of its signing. There is title insurance in Ukraine, although this type of insurance is used rarely. Investment in real estate property under construction is a well-developed segment of the market, and it constitutes a considerable portion of real estate market. The procedure for transfer of property in this segment of the market differs significantly from the procedure of transfer of property rights for built real estate. Also, the rules of cooperation and payment of agents` commission are different for this segment. No – but additional taxes. Sellers always represented. A small proportion will have buyer representation. Currently none, but HM Government announced, in April 2018, its intention to regulate and impose minimum standards. Is there an MLS or other shared listings site in the United Kingdom? Rightmove, On the Market and Zoopla. No title insurance – homes are sold subject to contract, lawyers for both sides instructed. Process currently takes between 14-18 weeks, at which point, contracts become binding. Low turnover of stock – approximately 4% of homes transacted annually. Average time spent in a home is 17-20 years. Fees paid by sellers average 0.9-1.3%.